(first published 1979 as "Dying, We Live"
This is the type of book one really can't review. How do you review the memoirs of someone's life, especially the most troubling time of their life. I finished this about a week ago and needed the time to recover before putting down my thoughts here. The author wrote these memoirs at the age of 16 while convalescing in the hospital after being liberated from a German POW at the end of WWII, at the suggestion of his doctor as an aid in his mental recovery. The memoirs were first published in 1979 and have been thankfully reprinted again. This is a book that should always be available for people to read as an historic reminder of what happened to Poland and the Polish people during the Nazi occupation and Russian invasion, their resilience, then the final backstab as they were handed off to Lenin's Communist Regime from which they didn't break free until 1989 with the leadership of Lech Walesa. Julian was a 10-year old boy when his country was invaded and he describes through a child's eyes what happened in his home, Warsaw, almost daily over the next five years. He goes from being a boy who can't wait to be old enough to join the army, to one who sees the men of his country being loaded onto cattle cars and sent off to labour camps. Then he tells the horrid and inhuman tale of the Warsaw Ghetto as the Jews, including his little girlfriend and her family, are rounded up and starved and slaughtered. His frustration at living in a house amidst his mother, aunts and little sister end with him going to live with his former Scoutmaster who recruits him for the Polish Underground (Home) Army, mostly teens and some children, boys and girls alike, who fought bravely against the occupation and matured quickly to be the ones who led the Warsaw Uprising in 1944. The whole story of Poland under siege, under occupation, is one of a country and a people with a tremendous amount of strength. Through their faith and their pride in the country's heritage they never gave up the fight from oppression, for freedom. 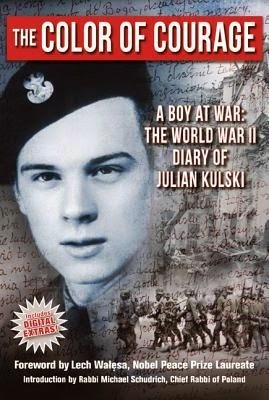 Kulski's memoir is particularly heart-wrenching and eye-opening as it gives an eyewitness account of Poland's WWII years through the eyes of a child as he grows to adolescence but never considers himself a victim even though he's imprisoned and 'interrogated' by the SS. Of particular note are this volume's visuals: there are many photographs from the era like nothing I've seen before. The slaughter, the devastation, the armed children at post in uniform, the hangings ... They cause the reader to pause and I did have to put the book down several times get an emotional breather. Plus the publisher, Aquila Polonica, has included several internet links to rare original footage the likes of which were either totally fascinating or heartbreaking. I highly recommend the book and hope this will stay in print for this and future generations to never forget what happened to Poland and how the Polish as a nation responded to oppression. Great thanks to Mr. Kulksi for sharing his darkest moments with the world.